He has completed his under graduate and post graduate in nursing under The Tamil Nadu DR. M.G.R Medical University, Chennai. He awarded Master of Philosophy [MPhil (N)] in Nursing, Manipal College of Nursing, Manipal University, MAHE. 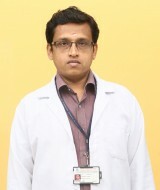 He also pursuing PhD Nursing, in Saveetha University, Chennai. His areas of interest in teaching – Medical surgical nursing, Nursing research, and Statistics. He has also organised and conducted national level work shop and being participated in various CNE programmes, workshop and seminar.